Lady Rosamund Painswick. What a name! And what a character. It’s good to have her back in Season 5 of Downton Abbey, after the actress who plays her, Samantha Bond, took time off from Downton last season to appear in a West End play. 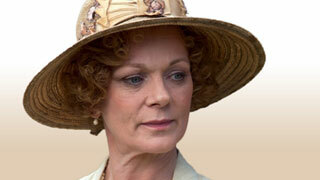 Samantha Bond as Rosamund in Downton Abbey. Like most - if not all - of the British actors we see, the 53-year-old Bond trained for a stage career. Initially she had wanted to become a ballet dancer, but her auditioning for dance schools at the age of 15 coincided with puppy fat, which put paid to that ambition. Instead she trained as an actor at the Bristol Old Vic, thereby continuing the family tradition. Bond’s father is actor Philip Bond who starred in The Onedin Line and most recently as Dr. Wyatt in an episode of Midsomer Murders called "Death in a Chocolate Box." Her mother was television producer Pat Sandys who was also an actress for many years, before the birth of her three children. Abigail, Bond’s sister, is also an actress, while her brother Matthew broke with tradition and became a journalist. 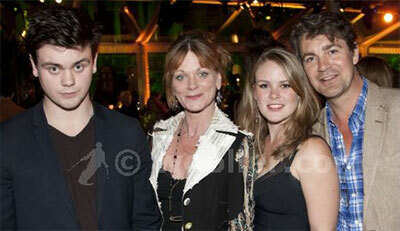 Samantha Bond with her family in 2011. Bond considers herself “very lucky”, although getting her first job after she left drama school didn’t come easy. She applied to every repertory theatre in the country and went through 12 auditions before landing a job in 1983 in the original production of the comedy musical Daisy Pulls It Off. The same year she was cast as Maria Bertram in a BBC adaptation of Mansfield Park and in Rumpole of the Bailey where she played Rumpole's pupil, "Mizz" Liz Probert. Within three years, the fledgling actress had appeared in 35 professional plays. She then ramped up her television work and you might remember her in the Masterpiece Theatre presentations, The Ginger Tree, where she played a young Scottish woman, Mary MacKenzie and as Miss Taylor/Mrs. Weston in Emma. Bond has also appeared in numerous Mystery series, including Agatha Christie’s Miss Marple and Hercule Poirot, Inspector Morse, and Midsomer Murders. 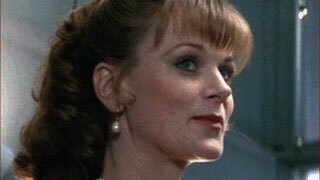 As Miss Moneypenny in 1995. In 1994 Bond was cast as Miss Moneypenny in four James Bond films, with Pierce Brosnan playing 007. She only retired from the role when Brosnan himself stepped down in 2005. According to Bond (Samantha, not James!) one of the best things that came out of her playing Miss Moneypenny was that it gave her a chance to get involved in more charity work. One of the charities she has supported for a number of years now is Action Aid. She got involved in the charity when she and her children were sitting at home one cold winter’s evening when an Action Aid supporter knocked on the door to see if she would consider sponsoring a child until they reached their mid-teens. Urged on by her children, the actress agreed to sponsor a boy called Brandon, and she is now sponsoring another boy called Kelvin, who lives in Kenya. Given her love of children and family life, it’s obvious that in real-life Bond is nothing like Aunt Angela, the character she plays in the semi-improvised comedy series, Outnumbered. Despite all her career achievements, which also includes being a member of the Royal Shakespeare Company, Bond still considers her biggest success to be her two children. Maybe we’ll be seeing them on our screens in the future. In the meantime you can enjoy seeing Bond as the meddling Rosamund in Downton Abbey which airs Sunday nights at 9pm. If you’d like to know what one of our favorite actors is up to lately, drop me a line.